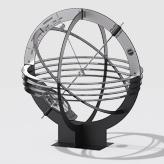 Equatorial sundial with spiral-shaped band (helix) that throws a shadow on itself. Garden model (height 2m). Piet Hein designed the sundial in 1986 for the park at Egeskov Castle in Denmark. 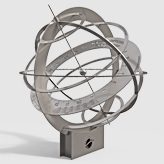 The unique feature of this sundial is that the shadowcaster and the shadowcatcher have been combined into one unit: a spiral-shaped band that throws a shadow on itself - a construction that is unique in the 3000-4000 years that man has been making sundials. 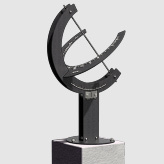 The sundial is available in garden, park and castle models, 2, 4 and 11 metres high, respectively.